Johnny is a longtime online writer and car enthusiast. As a BMW owner, he has years of experience fixing problems with their engines. Make sure to check your model to ensure it has the same actuator motor and gear as described here and in the videos below. I include here a description of the problem, links to outside information and some information on my own experience fixing this issue on a 2006 X3 E83 model. This article is for informational purposes only and the reader assumes all responsibility for attempting to fix without professional assistance. Having said that, with some basic automotive acumen and a few hours this issue can be fixed for as little as $50 or less to replace just the transfer case actuator gear whereas a mechanic or dealer would conceivably charge $1,500 to $2,000 or more to replace the transfer case actuator motor entirely (or worst case scenario attempt to replace the entire transfer case?). There is an very audible rapid clicking noise that comes from the transfer case (approximately under the driver's seat underneath the car) just after the engine is turned off. The best way to hear this is to open the driver's side door when parked, turn off the engine and listen for the clicking noise (it may not happen EVERY time so try it a few times). The noise should only last about 1-2 seconds, see the video included here for an example of the sound. If you have both of these symptoms then the culprit is very likely to be a stripped gear inside the transfer case motor. 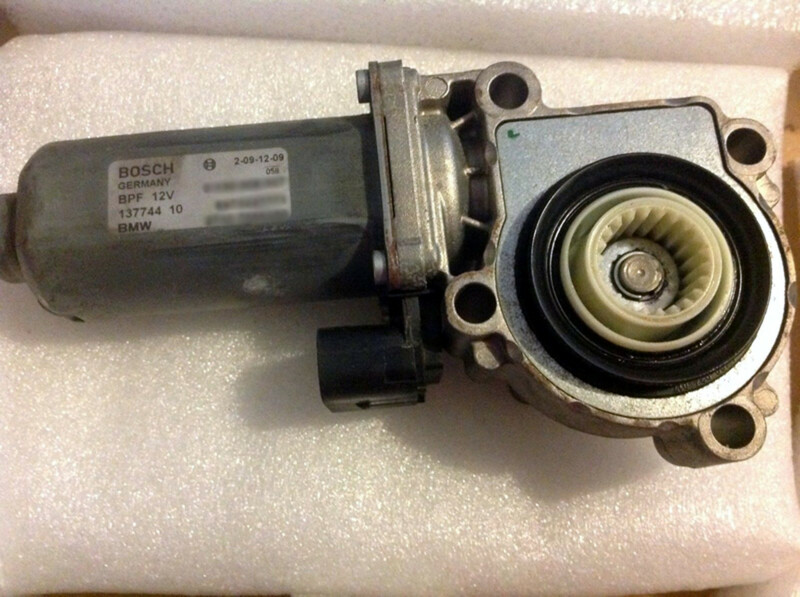 The transfer case actuator motor is a small motor that is bolted on to the transfer case and can be removed and replaced (or repaired with a new internal gear). If you DO NOT hear the clicking described the cause could be something else (not covered in this article). So what's going on inside the transfer case actuator motor? 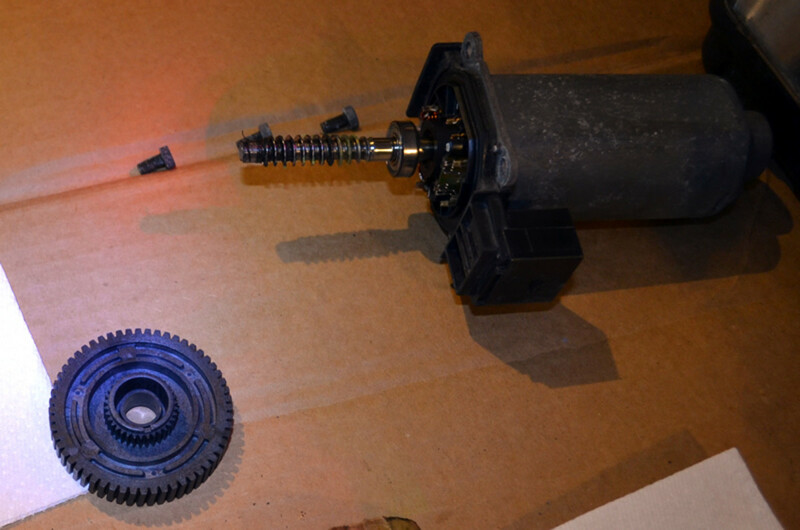 In short, there is a nylon (ie: plasticky) gear inside the motor that is turned by a metal worm gear (a screw). Over time the nylon part gets worn down and stripped and does not turn any more. See the photos. There is a lot of discussion in various forums about how this gear does not ever seem to turn all the way around and you can fix it by simply rotating the gear to the unused portion (a potential free fix). I cannot speak to whether that is a reliable long term fix since I did not try that. 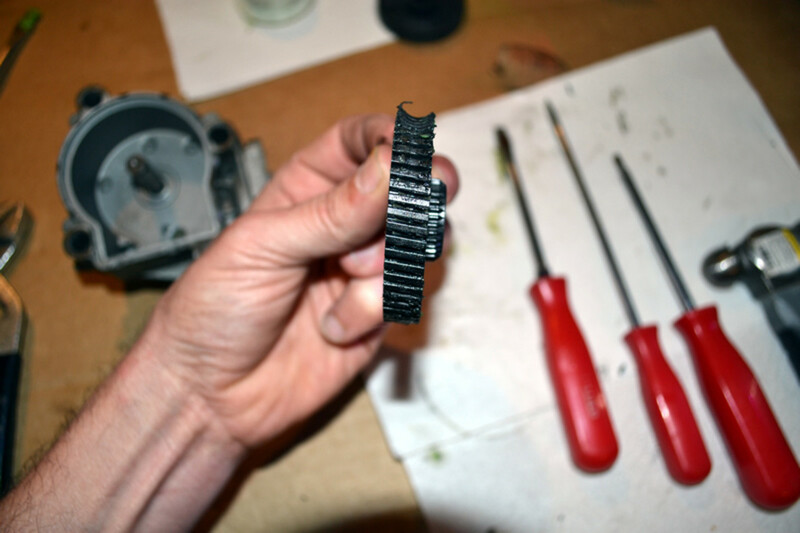 You can see from my photos however, that it indeed does not look like one side of the gear that still has the light green lubricant on it was ever touched or used by the worm gear,so take that for whatever it's worth. My experience (and decision) was that if I was going to spend an afternoon underneath the car removing the actuator motor and taking it apart I did not want to risk the free fix failing at some point and having to do it all over again. 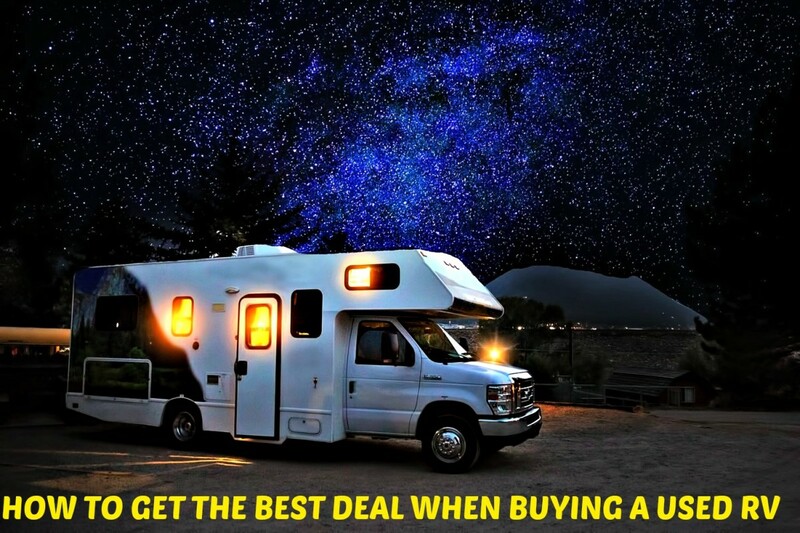 I believe it's well worth the $50 - $100 to purchase a new gear and not worry about it for another 80k miles or more. Since the first writing of this article, replacement gears have actually gone from $100 down to $20 or less! 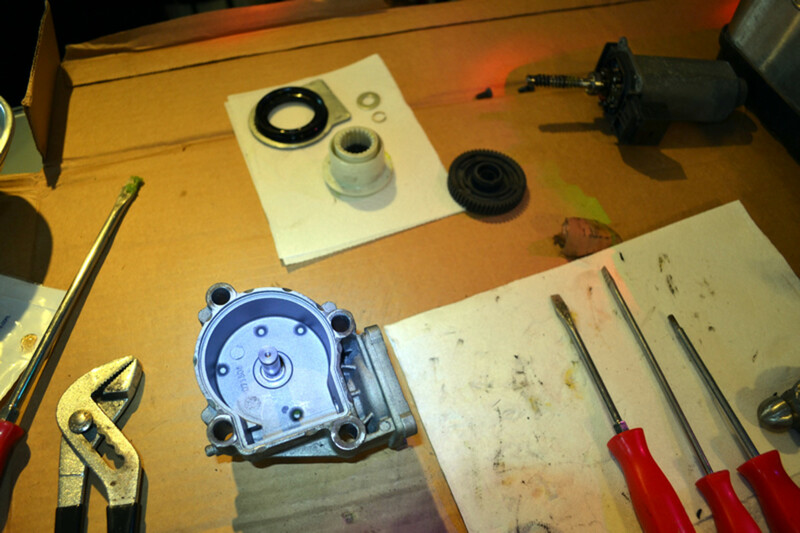 BMW transfer case actuator motor disassembled (brand new black replacement gear pictured). Close up of the new replacement transfer case actuator gear and the motor housing metal worm gear. 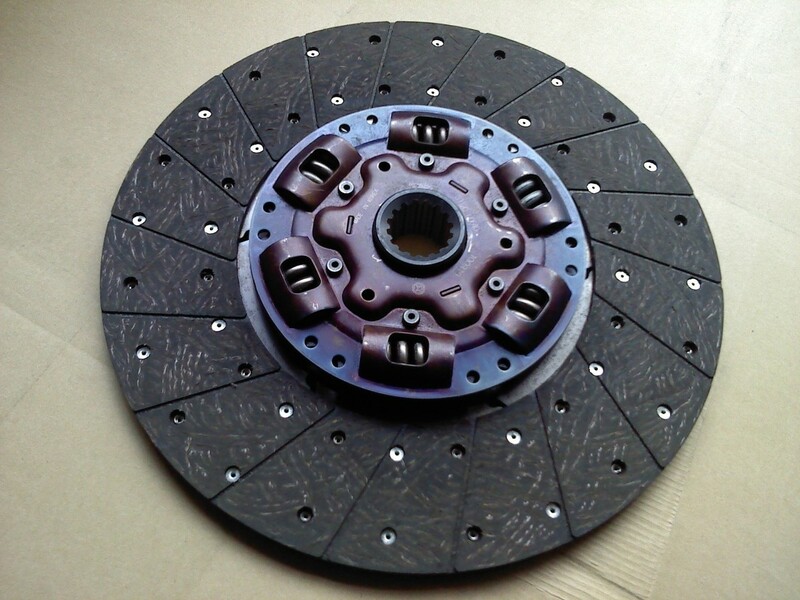 Worn transfer case actuator gear. There is a totally worn concave section on the top. Worn transfer case actuator gear from another angle, top portion totally worn concave. Old transfer case actuator gear unworn side. 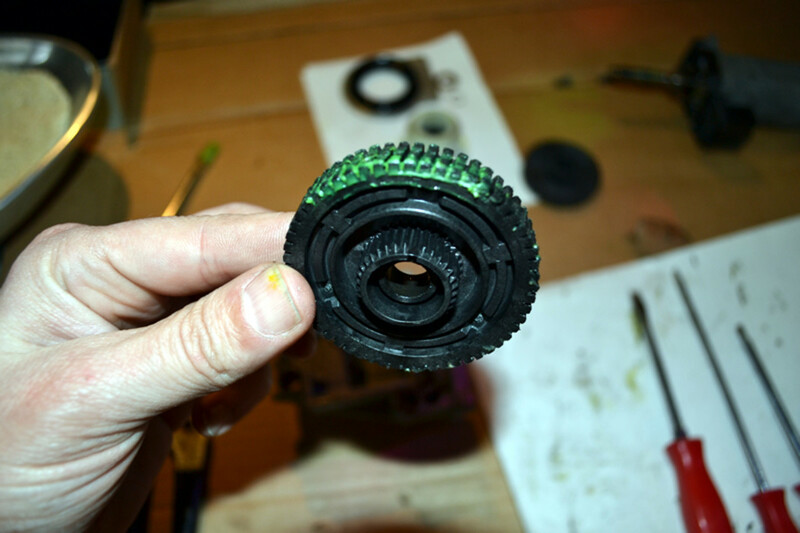 This is straight out of the motor, bright green lubricant appears to have never been used/worn by the worm gear. If you've determined from watching the video above that you have this problem you can fix it yourself by either replacing the entire motor unit (still somewhat expensive at $800 or so just for a new motor), or you can go a step further and replace just the motor gear by following along with the video below. You can order a new gear easily on Amazon with the provided link. 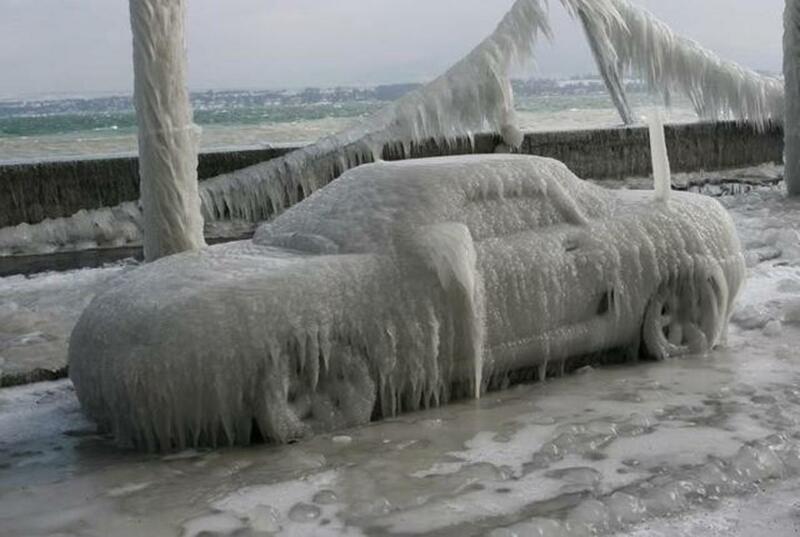 Make sure you've let the car cool significantly (overnight would be a good idea) before attempting. You may need some special female torx (star) socket bits for the bolts that hold the actuator motor on (link below). Some universal socket joints for accessing the torx bolts (I had a hard time getting my socket wrench to fit in the space, only was able to do it with a universal joint). After replacing the gear 1 month ago, all light is coming off. It was second time to replace it. condition of my car is much better. However, some chunk around gear case is coming when slowly stopping and curving to right/left. Is there someone who is having same problem? If yes, how to solve? I concern all light is coming up in the future. I change the rear both sensor, brake pad and break sensor, sensor ring and transfer case gear but still abs, brake and 4x4 coming on and off did not make any difference. I t cost two diagnostic test and all the parts plus labour but no improve. Garage guy have no idea what to do next. how to check if there is enough oil in the transfer case. I saw an aluminum gear online. Do you think this will work? ABS, 4x4 and Airbag lights were on. Clicking noise audible when shutting off car. Just fixed this yesterday. Mechanic wanted $1400. I fixed for under $20. Thank you! Hey now, this is a terrific resource; thanks. My situation: 2008 E83 X3 80k miles. My 4x4 light is on most of the time, sometimes on start up and other times after going over a bump. Every so often (rarely, but enough that I found this page) the other two "lights of death" come on as well, but only for a brief time - like, off on next restart. No clicking. This has been happening on and off for 6-8 months. Took the car in for routine service a while back, they said to replace the transfer case motor and I declined. Since then the lights continue their intermittent glow - 4x4 regularly, the other two rarely. Still no clicking, and the car seems to drive fine. So here we are, 12 months later. 94k miles. Same intermittent lights; the regular 4x4 and the occasional 3 lights of death. No clicking. How concerned should I be? Anyone with any ideas? All 3 indicator lights have been on in my 2007 X3 for approximately a little over a week and I have been still driving it daily as I have no other form of transportation. One auto shop quoted me $1400 -$3300 new/used to replace the transfer case. I just read this article and called another auto repair shop, having a hard time finding anyone to check if the fluid or gear needs replacing. Any idea how much longer I will be able to continue driving it? I really appreciate the information provided in article, I wish I could repair it myself. Just picked up my X1 Xdrive from the garage. They changed the transfer box oil and took it for a long test run. Very happy to say the problem has gone and the gears smooth no clicking ticking nothing. only charged £82.20 fantastic garage and not a rip off like main BMW dealer. If you have noise from transfer box please try the oil change first. Good luck everyone! Hi Mylesx1, I have the same issue with my X1 Xdrive. It went into the garage and they changed the torque converter and a software update, but sadly still the same. Back in the garage now they think it's the transfer box. Can I ask have you had your X1 repaired and what the problem was please. Thanks Paulx1. Thank you so much! The dealership wanted almost $4000 to replace the whole transfer case. I used your link above to order on Amazon, which is now $10! My husband fixed it!! From everything I read, I guess I'm lucky to not have had this problem until 149,000 miles in my 2006 X3. I am hoping to get some advice from the pros here. I had a similar problem so after my research, I've decided to change the transfer case oil. And amazingly, the vibrations and lights went away. Who would have thought that! Now after 5 months, the vibrations and the lights are back. Next day, I only see 4x4 light. It's not the gear as that was replaced recently. Can it be the motor? Would love to hear your feedbacks. Thanks. I have 2008 X3. Thanks everyone/johnnyvest for this post. I've got a BMW X3 2008 102,000 miles(babied and garage kept). All lights 4x4 including ABS came on and stayed on 2 days ago. Dealer wanted almost 4200 to replace transfer case! Took it to a local guy to fix instead. Waiting on his opinion. Thank you all for the info. At least I'm not alone out there. Having repeat front Drievshiaft failures - Could this be the source ? My car is only moving in gear 5, BMW 320i. What could be the problem? Thanks for all the info man much appreciated!!!! Super thanks for this very informative post @johnnyvest, it saved me thousands of dollars! I have a 2006 X3 with a mileage of 60k kilometers here in the Philippines and the BMW shop advised me to replace the transfer case, which would have cost $4000+, excluding freight and taxes to the Philippines. After reading about this, I ordered the gear for $10 in Amazon and had my mechanic install it for $50. Thank you for post these problems. It makes me feel really good that my mechanic has my interest at heart. Hi @marguerite ... I'm not sure how receptive mechanic shops will be to simply replacing the gear, it all depends on the shop. I'm sorry I don't know any shops to recommend, although I actually grew up in Houston in the 77095 ... i never owned a BMW back then! Best of luck. Hello Faizel, obviously I cannot say for sure, but you should be able to tell if the gear is worn by the clicking noise that should be present if that is the issue. Watch the first video above, right at 1:20 he demonstrates and records what that loud clicking sounds like. Also, the only reason I can think of that the entire actuator might need replacing is that the motor has failed, or it just does not function any more. You should also be able to hear this motor activating right when you turn the car on or off (it's easier to hear right when you turn the car off since there's no engine noise). The sound is almost a buzzing sound for about 1 or 2 seconds ... sounds like "zzzzzzzzzzt". If you hear the buzz, I'd say the motor is still working and activating and it might just be the gear. I have had a problem with sounds coming from the gear area whilst taking off. I took the car in for a check and the auto transmission guys say the entire transfer actuator needs replacing. I asked if the gear is worn and he said no, the gear is fine. If that is the case, why would the entire Actuator case need replacing when there was only a slight miss and catch between gear changes? Not sure if I should insist on just changing the gear and see if this works? @dion - Sorry but it's hard to say with any certainty what the issue is for you. Since you mention that you only get the grinding/binding in the front wheels when you had the new gear installed (this would assume that the transfer case motor is then working and engaging the AWD at startup) it could be an issue with your transfer case itself or your front differential? When you turn the car off the actuator motor should disengage the AWD system ... then when you replaced bad gear again it might not rengage AWD properly again and thus no more grinding? This is all purely conjecture ... I really cannot say. Ok I replaced the carbon gear 14 months ago on my 2007 X3 and everything was fine. Then a few weeks ago the lights came back but only the 4x4 and when I would make tight turns like in a parking lot or backing out of my drive way the front wheels would lock or skid. I was like WTF now!! So what I found out was that the actaul motor on the unit locked up and was toast. I found a new transfer case motor for 350 and decided I'll just replace the whole. So I did that and all three lights are on again and was told it needs to be reprogrammed!! Is that a true statement????? Do you think this is a sign that the gear is wearing out and will eventually need to be replaced? Thanks again for the fabulously detailed instructions. Hi @Greg. I'm not sure what your problem may be, the only real clicking sound that is 100% indicative of the worn transfer case gear is a very audible clicking that lasts about 1-2 seconds that typically happens right when you turn the car on or off. In the first video above, he demonstrates what it sounds like right at 1:23. 2007 x3 93k miles I was on the ground bleeding the front roadside brake with the engine running, and i heard a ticking from the general direction of the bell housing maybe a little further back. do you know if the transfer case actuator functions at some level with the transmission in the park position? was thinking i would pull it off and look at the gear before it gets to cold. My abs light,brake,and 4by 4 light came on and radio and ac light dimmed. Went to get my battery checked they said it's good. All the lights have gone away but when I start my car the 4x4 light stays on amd i dont hear a clicking noise at all. Update: I tried removing the actuator again, this time lowering the transfer case after removing the brackets (the first time I supported it with a bottle jack per another video). Once the transfer case was lowered, I was able to access and remove all the bolts. I replaced the gear and reinstalled the part and it is working great. I would like to add that I never heard the "clicking" sound, I only had the light trifecta. The gear was worn as shown in the video. Just wanted to follow up and say that I took everything back off, flipped the black piece back over the correct way, reattached everything and when I started the car - no lights! Thanks for a great article, extremely helpful and saved me so much $$$! Thanks Johnny. My issue was getting the socket, attached to the wrench, onto the upper torx bolt. There was no room between the end of the torx nut and the frame of the X3 to get the socket on the nut. Are you saying if I had not supported the transfer case with a jack (another online video says to do this), the case would have come down a little so the end of the torx nut would have been below the frame of the vehicle? Hi @Ben77059, on the 2 jobs that I have done I do remember it being very tight to get to those upper bolts. I loosened the support cross bar like it the video and pulled it down a bit (gently, it doesn't have to come down too much) and that does provide enough room to get in there. It's still a tight squeeze. I am glad this thread is still active. I have the same issue on an '07 X3. I could not remove the Actuator. I had an E10 torx socket, but I could not get it and a ratchet wrench on the top bolt. Any suggestions? I did support the transfer case, had I not supported it, would it have dropped enough to get the socket on the bolt? shaggy474.. can it really be low tire pressure or needing new tires I have this trio of lights on since friday, today is tuesday, and it also has the low tire pressure light on as well, in fact, the LTP light was on when i purchased the car 6 weeks ago! its been in the FORD shop 4 times since then, had a loud exhaust within 3 days of purchase, hood would not open, still in shop for that right now, needs a new cable release, and now the lights?? I bought this because it was a 6 speed manual and had 40,000 miles on it.. its a 2005. i fell in love.. would love your input. HI, I saw this post because my 2005 x3 that i just bought with only 40,000 miles on it just started doing this. the low tire pressure light as on when i bought it, they said they reset it, but it came back on and then the other three came on. I dont think i hear any clicking.. so i wonder if its the tires ? Its in the shop right now, a non btw shop, so i have my doubts about them.. but i had to have this car.. 6 speed manual, and 40,000 miles!!! Thanks very much. The Transfer Case Actuator Motor gear has excellently worked for me on X3 here in Kenya. I change the gear and only works for 10 minutes, later changed the transfer case motor and still have the 3 lights on, my mechanic told me about update all the software of my 2007 x3, what do you think? Very very helpful post, thanks! My 2007 X3 has been doing this for some weeks (but driving fine) and the BMW dealership here in Cape Town, South Africa, has quoted me the equivalent of $2700 to simply "replace" the transfer box, after importing a new one from Germany. Bah! I'll get a friendly mechanic to do the job for one-tenth the price! Thanks again. I have a 2007 X3 3.0SI with 94,000 miles. I bought it used in Germany with 50,000 miles and I put 30,000 autobahn miles on it spending as much time as I could on the speed limiter. I then took it to South Korea where I have put the next 15,000 miles on rough, uneven, mountaineous roads. I use the 18 inch dunlop D4 winter tires and the Pirelli P Zero Rosso summer tires on 19's. I will post when I do have a problem, but I enjoy slightly spirited driving in the snow and rain and have turned some decent laps with it on the Hockenheim race track. Hopefully I didn't just jinx myself with this post. Just found out that I need transfer case repair. The quote is $2700. I have a 2008 X3 with 144,000 miles. Seems like it's time to trade it in, instead of another expensive repair. Just curious if anyone that reads this will tell me that everything I have loved about the X3, I could possibly find in another make/model. If I go from 3.0 6 cyl to 2.0 4 cyl, will I notice that big of a difference in handling/performance? So here is what I did right after I posted the question. I went through and cleaned the brushes and spindle just to make sure there was good contact and everything moved and rotated freely. Still could not get the gear to rotate after putting the gears back together. I put the assembly back on the transfer case and rotated gently back and forth on the tranfer case gear until I felt it slip. I was then able to spin the white gear. I think what happened was the worm drive screw edges may have been sitting on top of the gear and not seated in the grooves. Got everything put back together problem solved, indicator dash lights went out. @Greg Dockstader: I seem to remember that you could rotate the white gear but that it wasn't easy to turn since the motor and worm gear provided a good bit of resistance. It sounds like you're putting it all back together correctly. I mean really unless you it goes back together correctly it won't really go back together at all (meaning that the white gear fits right into the inner gears of the new black replacement gear and the metal worm fits into the grooves on the outside of it). When starting the car you about a second after you start the car you should be able to hear the motor actuate. Listening from the outside of the car it sounds like a quick 1/2 to 1 second long buzz. That's what it sounds like when the gear is in working order ... when stripped that is what made the loud clicking sound (the guy in the video has audio of that). I took everything back apart, checked all the plug prongs, brush springs and brush seats on the spindle, bearings, everything appears to be fine. The white gear linkage to the new cog seems to rotate freely, the worm drive screw to the motor wind seems to rotate fine in housing when taken apart but rubs a little, I imagine the bearing on the shaft holds the alignment where it should provided there is no play in the bearing case. Once I put the motor back on the drive I can't freely turn or rotate the white gear. Should this gear be able to turn with at least a little force? I see you're in SLC area, I live in Riverton. Is there any way to PM on this forum? @Greg Dockstader: The lights should go off on their own, at least they did in both cars that I have done this procedure for. You might want to try turning the key to position 2 (the last one BEFORE the ignition actually starts the car) and leave it there for 30-45 seconds before the car starts. Then start it and see. PS: Regarding getting the cover plate off the motor ... yes it's always taken me a while too, probably about 20 minutes or so each time just because I didn't want to mess anything up. It can be a tricky little SOB though. Just replaced the gear. Everything went well and back together as easily as it came apart except for pulling the peened cover plate to access the gear. Watched a YouTube video where the guy was able to pop the plate out in about 15 seconds, the whole project took about 2-1/2 hours and 45 minutes just to get the cover plate off to access the gear! Everything is running fine, no abnormal noise when cornering like Fernando described. Only thing is the ABS, brake, and 4X4 lights are still on. I've only taken it out for about a 5 mile loop and no change with the indicator lights parked and running or driving. No problem @John Hawaii ... I saved myself big time money and just wanted to spread the knowledge. I think it's pretty weak on BMW's part that this plastic gear will fail on probably EVERY car that has this transfer case actuator. Brah, you saved me big $ on repairs for my 2007 x3. Mahalo for taking the time to post these videos and make this blog. Aloha. Hello @Samuel Chen! Sorry to see you're also having the problem. What you describe with the lights coming on and off is pretty common with this issue, I know on the 2 cars that I have repaired that was the case. It's hard to say exactly if replacing the carbon gear will solve your issue, but given the cost of A) a new actuator motor and B) a new transfer case ... it seems like it might be worth trying to see if that's it? 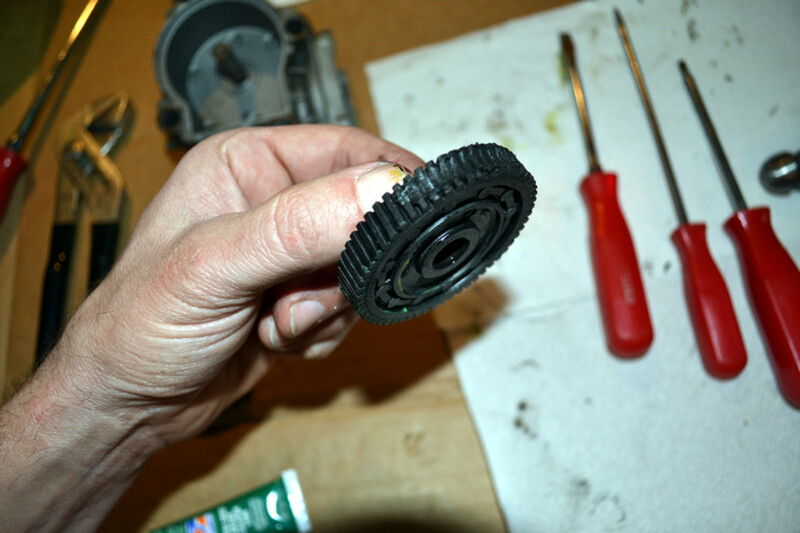 With your comment "of the gear of the transfer case is chipped" they might be referring to the actual spindle in the transfer case that connects to the white tooth circle in the center of the actuator motor (pictured above). This seems unlikely as I think that spindle is metal (if I recall correctly) and many teeth on that (or the white plastic ring in the actuator motor) would have to be stripped in order for it to fail to actuate (turn). One thing about attempting the carbon gear replacement is this: if you get it all taken apart and disassembled as above you should be able to see the worn section on the gear. If that is present then replacing the gear should fix the problem. If your gear is not very visibly worn as in the photos above then that may not be the issue. I have a same problem as you describe, the brake light is red, AWD ABS EBV 4x4 are all yellow. my car model is 2008 X5 93210 miles. Except I don't hear the rapid sound ,instead of just a quick one sound '' click''. I just had theses all lights on 4 days ago. The lights all come from when the car running for a while, after put off the engine, that signals disappear.The bmw dealer have checked this problem today, he said that it's transfer case motor that should be replaced, if the gear of transfer case chipped, I have to replace the transfer case that I felt very doubtable. Would be this case just do as same as described for replacing the carbon gear ? issue 99% of the time. Rotate often and check tread depth religously. I would teplace all tires at early signs of wear. Otherwise you will do this repair often! thanks for the explanation really really great. My car has 97000Km and I am not quite sure if I need the transfer case actuator replaced or the big metal box which attached to it...???? 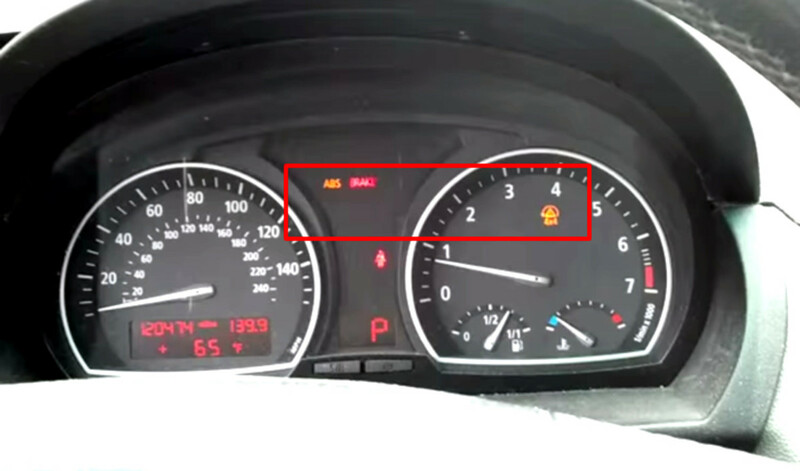 I have this problem on my 2008 BMW 330xd : all lights on + that noise. I didn't find any gear online for this model , only for X3 and X5 models. I assume is the same thing. Am I mistaking?!?! Anyway I will just rotate the gear 180 degrees and see if it solves the problem , at least until I find a new gear. Anybody know anybody in fort lauderdale area that can install the motor gear for me. Ill buy the part on amazon. My mechanoc would not do it unless i repale the transfer case. Where exactly is chase race? I replaced the gear but not my X3 is acting funny. Hello @B Paul ... it's difficult to say how safe the car is to drive. Are you experiencing the symptoms exactly as described in this article? 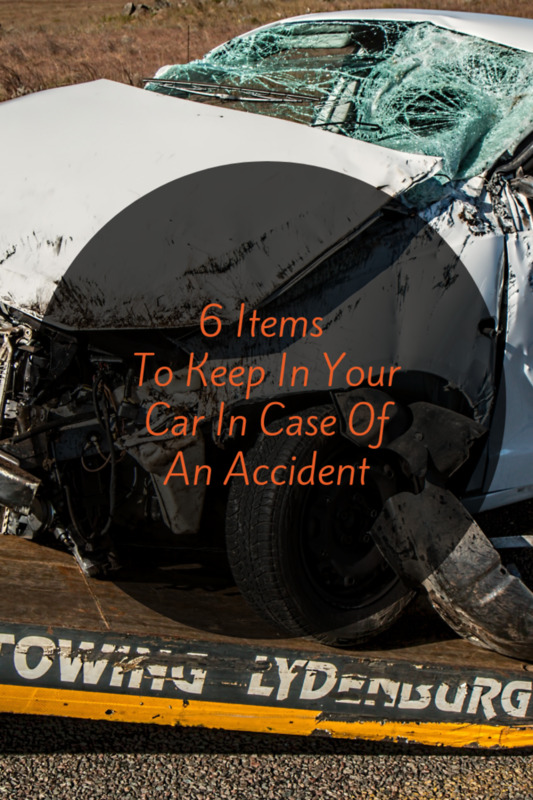 If so then it is likely your actuator motor and the transfer case might be ok. If not, it could be the transfer case is bad. There is no way for anyone online to answer that for sure. How many miles on your car? All I can say is that you could try ordering a replacement gear and seeing if you local shop might be willing to replace that in your actuator motor and see if that fixes your issue. Very helpful ! Thanks for the information ! I have a X3 from 2007 with that problem, bought the gear from AMAZON, it cost me about 65 €, and i will install it tomorrow ! Hope it will works. BEST REGARDS FROM PORTUGAL ! Well I'm not sure. It would seem that you fixed the transfer case gear problem if you're not getting the clicking any more. I can't really say why the lights would not be going off. My experience with having done 2 of these is that the lights went out shortly after and did not come back on. Gear was bad and new one is in. Hi @J Goode, in my case I did not have to reset the light. I assume you've started/stopped the engine and driven the car around. Do you still get the rapid clicking when turning off the car? In many cases with a worn gear the lights would go on and off after stopping then driving a bit. Had all the same symptoms, even the clicking. Changed the gear but light are still on. Does it have to be reset? Thanks for the great write-up - saved me almost $3000 for a new transfer case for our X3 as quoted by BMW Seattle. For anyone else in the Pacific Northwest, Doug at Chase Race installed the gear for me, thanks Doug! @Jonnyvest: Thank you for this post. I am a proud owner of a 2007 X3 that I imported from Canada to small central african country of Rwanda. My car had the problem at 106,000 km and you can imagine if you add shipping and duties on a $1500 spare part. By reading your post, I knew more than most mechanics here who always advise well off people to by new BMW actuator when they see the symptoms. It took us less than two hours to dismount the actuator and rotate 180 degrees the gear, mount back and problem was fixed! Now my mechanic is actually considering reaping benefits from this workaround. As long as the engine is ok, I will have spare gear ready. But I am sure the one I have just rotated will do another 100,000km with no issue. Thank a lot Jonnyvest. Thanks for the comment @Jean-Jacques, I'm glad this information was helpful to you. Please report back if your gear rotation ever slips back into the worn out part and you get the problem again, I'm interested to know the longer term results of that work around. Cheers. Thanks again Johnnyvest. Have a great weekend. It should not. My wife drove hers with the problem for probably 3 weeks. I believe the actuator turns the all wheel drive system on/off (though I'm not sure exactly when or why) so you might notice a difference in how it feels. We noticed that the lights would go off typically after parking the car and would come on while driving. I assume this was when the wheels were slipping. Again I'm not 100% sure on this but my experience was that driving it did not adversely affect it. Hi @HARRY DION. I'm not sure how much they'll charge, but it shouldn't be more than about 3 hours worth of labor. 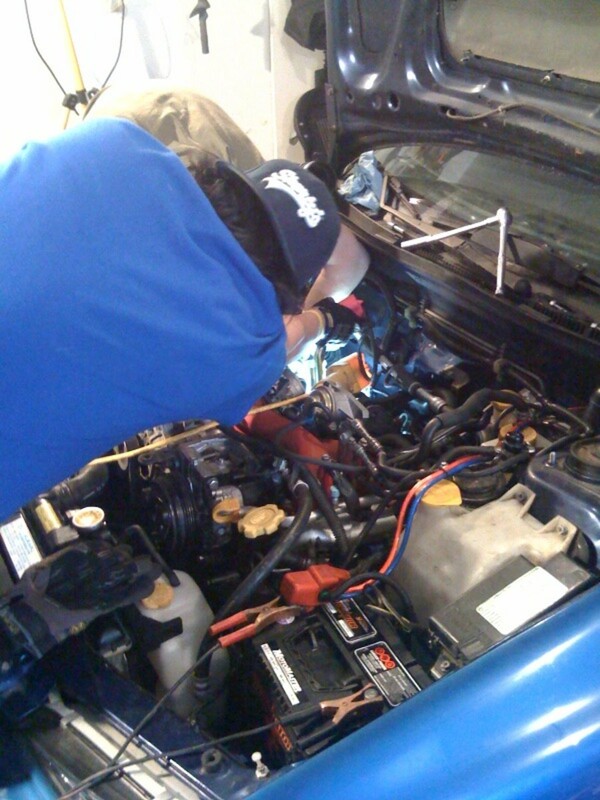 That includes removal, dismantling the motor and replacing the gear, and re-installing. I've done two of these and the first took a while since I was being ever so careful but for the second one I did it in under 3 hours and I'm not a mechanic and that was doing it in a driveway, jacking up the car, etc. For a good mechanic to remove the motor shouldn't take more than 10-15 minutes. As for the price of $1,100 thanks for sharing. That's actually a pretty decent estimate if they're replacing the motor all together, my local dealer has a $900 price for the new actuator motor, just slightly more than what you can get online. So they're probably estimating that for the part plus 2 hours labor (assuming about $100/hr). Thanks for the feed Johnnyvest. It was a very helpful hint. I just bought a 2008 X3 with 88,000 miles and I'm having the same problem. I took it to the BMW dealer and they were going to charge me $1100 dollars to fix the problem. I will order the gear from amazon. I found one for $56. Any ideas how much they charge for labor to replace the gear? I keep saying that every one of us that has done this gear replacement needs to hang the old worn gear from our mirrors as our own "rite of passage" fuzzy dice because make no mistake, EVERY single one of these X series cars will have this problem and need it to be fixed most likely before 100k miles. It really is a pathetic oversight and lack of quality on BMW's part. I'm guessing most dealers will act like they've never heard of the problem. Thanks for the feed back @Dennis ... I just did my second one, this time on my aunt's 2007 X3 ... same exact problem at right around 80k miles. Replaced the gear and problem solved. Had the same problem with my 2006 X3 ordered the gear took it to my service center paid for 3 hours labor problem solved.